PHOTOS: The Street Vendors Of Lagos Island Are Artists As Well As Entrepreneurs : Goats and Soda Photographer Lorenzo Vitturi was amazed by the "unstoppable" crowds, the energy — and the unexpected art in the street market on Nigeria's Lagos Island. 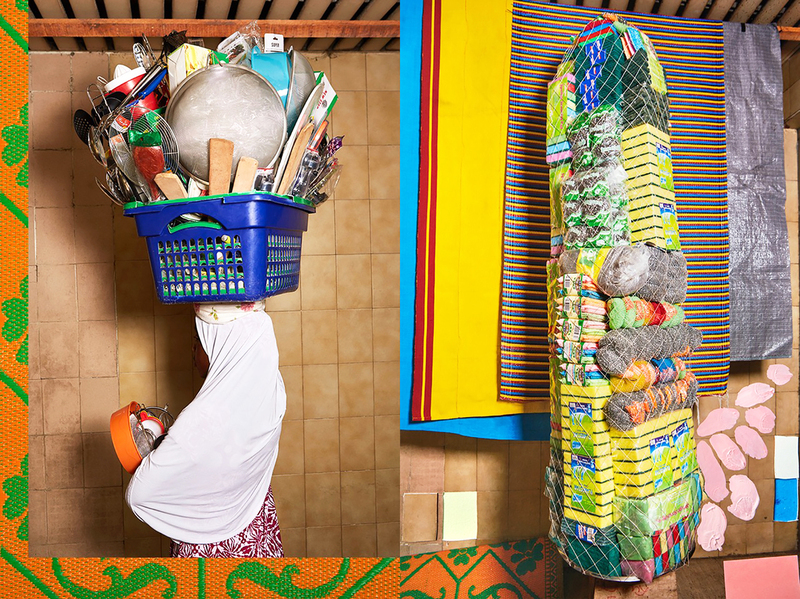 Photographer Lorenzo Vitturi assembled this collage of products sold at the street market of Lagos Island, Nigeria, including the T-shirt that gave him the title for his new book: "Money Must Be Made." And for the most part, his instincts were right. 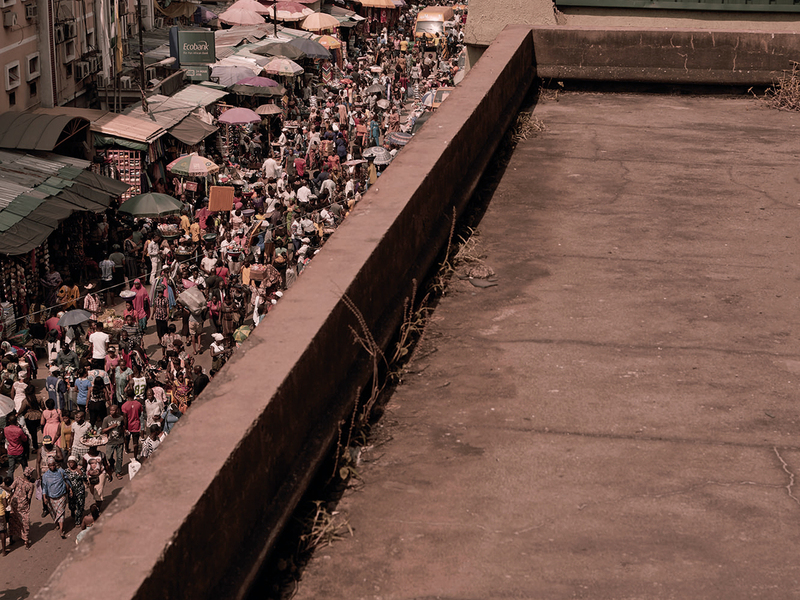 In Africa's most populous, fastest-growing city, mass evictions have become almost commonplace. But on Lagos Island, one of the oldest parts of the city, Vitturi was delighted to discover what he calls "reverse gentrification." Connected to the mainland by bridges, the island is the overcrowded home to the local government as well as the sprawling Balogun street market, where vendors hawk plastic furniture, cleaning products, bed linens, baskets, lipsticks and hair baubles. Over the last two decades, the stalls have steadily expanded and pushed out all of the international banks, airline companies and real estate firms that used to inhabit that part of town. The gray-pink Sahara sand that blankets every surface of the abandoned Financial Trust building is a haunting contrast to the teeming market of Lagos Island. One of the last remaining vestiges of the area's corporate past is the 27-story Financial Trust House. The skyscraper — which was once lined with cubicles and buzzing with business executives — now lays empty. Gray-pink Sahara sand has swirled in through the paneless windows of the abandoned building, gradually blanketing every surface. "I loved the contrast of this gray internal landscape with the colorful chaos of the market outside," Vitturi says. "It's incredible, because these Nigerian street vendors have sort of reclaimed their land from the big corporations." Of course, the corporations didn't go away altogether. "They've just moved to another area," Vitturi explains. But Balogun, its enterprising vendors and its unabating crowds had captured his imagination. Vitturi's book Money Must Be Made is an ode to the market, featuring portraits of the vendors, taken over the course of several visits to Lagos, juxtaposed with photo collages that Vitturi made by cutting up his pictures of the products they were peddling. We spoke with Vitturi about what drew him to Balogun, and how he put his book together. The interview has been edited for length and clarity. What brought you to Lagos in the first place? I was invited to do an artists' residency there by the African Artists' Foundation, which is an arts nonprofit in Lagos. They had seen my previous book, Dalston Academy — which is based around Ridley Road Market, which is a very, multicultural, largely Afro-Caribbean food market in east London. I had never been to Nigeria, or even to the continent of Africa, but I had actually grown very familiar with Nigerian culture, with Nigerian foods, from just living for a long time in this part of London. It seems like you have a thing for markets. I guess so! I had not at first intended on focusing on another market. But then I discovered this incredible story of Balogun. Whereas in London, the market was fighting a losing battle against gentrification, in Lagos it was just the opposite. The market had won. What struck you the most about Balogun? The crowd is unstoppable. There's continuous movement. I love the feeling of being there. For some people, this might feel a bit stressful. But for me, I just love the energy. And then the other thing is the creativity, the ingenuity of the vendors. Every day they invent new ways to sell things, to get an edge in business. The one thing I wish I could have captured in the book is the audio techniques different vendors would use. For example, there was a tailor who would walk around with a sewing machine balanced on his head. And in one hand, he was carrying these big scissors that he actually played like an instrument. He would open and close them to make this sort of tch-tch-tch-tch kind of sound in a fast pattern or rhythm. So in this crazy chaos of the market, you can hear that noise, and you can find the tailor. What you can see in my book is how some vendors invent a new art installation every single day with the way they display their goods. You see, for example, a man selling simple things like different soaps and toothpastes. But the way he has arranged all these items, to me it looks like an altar. Interspersed with portraits of the vendors, you've included images of collages and sculptures that you made, using materials you bought at the market. Why is that? My ideas for the collages and the sculptures come from the vendors. I was inspired by their artistry. But the point of these is to show a mishmash of all the items being sold and take different items out of context so that you can look at them in new ways. What were some of the most common items being sold? I was really interested in observing how there's an invasion of Chinese-made products. Take the fabrics, for example. 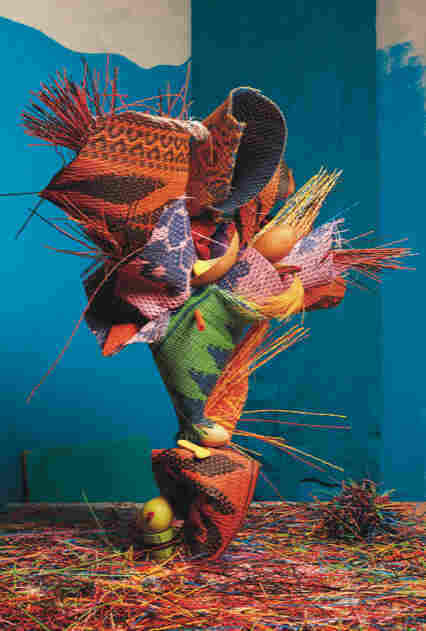 Nigeria has a long and important tradition of producing textiles. It used to be a big part of the Nigerian economy. But now the Chinese have arrived with their cheaper alternatives. These are just copies of the traditional African patterns, but the price is just incredible — super cheap. I also bought several prayer mats. These are made in Ghana and are made of plastic — because they are used on the street. So they have to be cheap, light and durable. But I liked how beautiful and colorful they are, so I used them as a makeshift backdrop when I took portraits of people at the market. And later, I deconstructed them and used them in some of my sculptures. In many of your portraits, you can't actually see the vendors' faces. In several cases, they're obscuring their faces by holding up the items they sell. How come? I started posing them that way because most of the women I photographed were Muslim. And they'd tell me, 'I want to be photographed, but I don't want to show my face.' But this approach really worked to my advantage, because these vendors are so connected to the objects they sell every day. This is their livelihood and their life. Some female vendors did not want to show their faces in a photo. But Vitturi liked the idea of picturing faceless vendors, whose identities are secondary to the products they sell. How did you come up with the title Money Must Be Made? 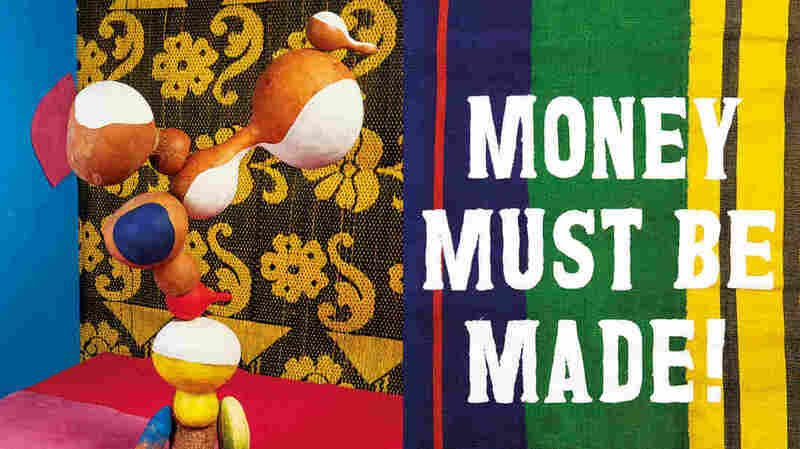 A man I met at the market was actually wearing a shirt that said "Money must be made." When I asked him about it, he told me this should be the unofficial Lagos motto. People from all over the country go there to do business, to make money, to make their dreams come true. What did the people in Balogun think of your book? I have yet to show off my final product in the market. Although, I did an exhibition in Lagos at the African Artists' Foundation. I really don't like it when photographers, especially Western photographers, go to foreign places to click photos and then just leave. The people who are actually in these pictures never get to see their own images, or see how they've been represented. So to avoid that, I printed a series of dummies or mock-ups as I was putting the book together, and I presented them to different people at the market. I was interested to see their reactions, both good and bad, and I actually have published some of these [reactions] at the end of the book. One woman, she said, 'I don't understand why you left so much white space.' Which I think is quite funny, because of course, in Lagos it's so crowded and every inch of space is occupied. So the idea of a white, unused page just doesn't make sense in that context. Anyway, I am thinking about how to do another show where I can present my finished book to the vendors at Balogun. Have you considered setting up a stall there to sell copies? I did think about it. But the thing is, there is absolutely no space for a new stall! 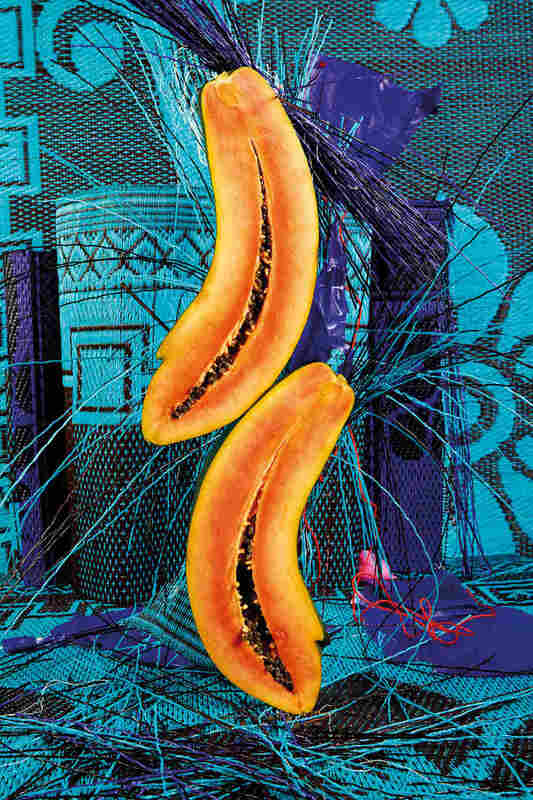 A previous caption incorrectly identified the fruits depicted in Cyan Deconstruction #1 as calabashes. They're actually papayas.